Ya know how Mommy Dearest feels about wire hangers? I feel the same way about metal artificial tree bases showing. 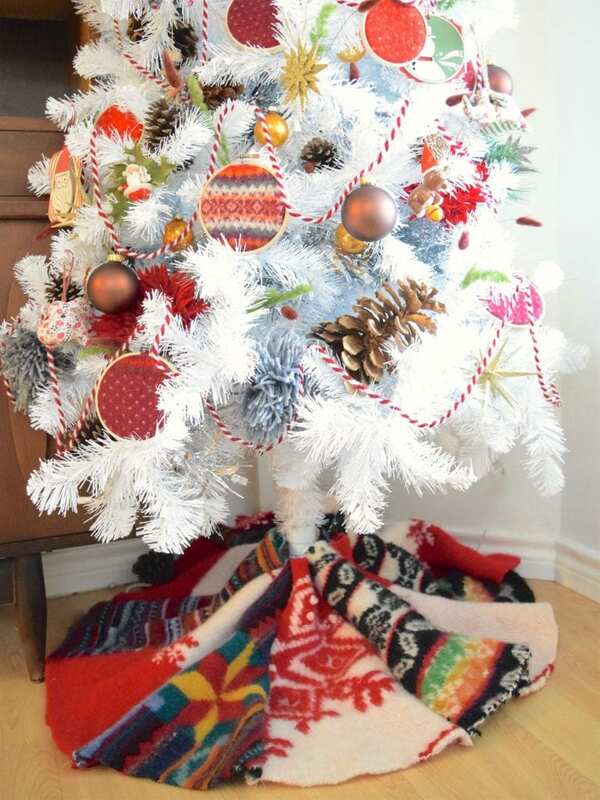 Before I go completely Joan Crawford let’s discuss adorable clever and crafty Christmas tree skirt ideas. I’ve round up a few of my favorites to get you inspired and to ensure that no naked metal tree base is ever left exposed again. 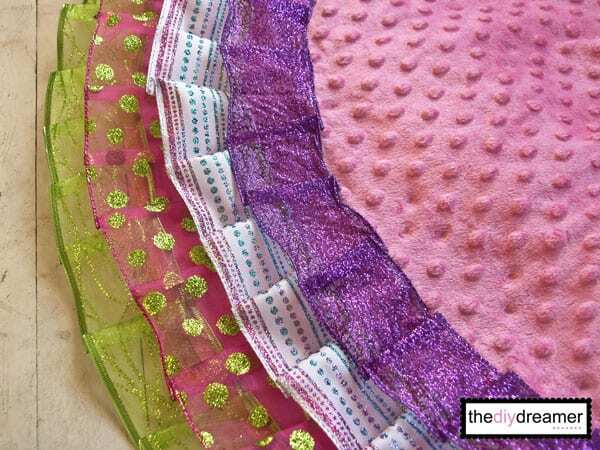 One of my favorite tricks is to buy a ready made felt tree skirt for under $5 and get crafty with the embellishments. 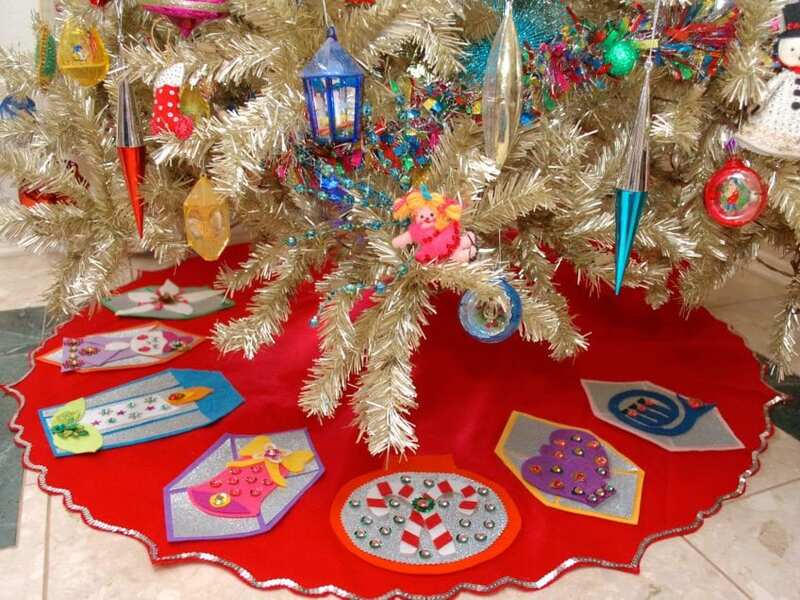 This Vintage Inspired No-Sew Felt Christmas Tree Skirt was inspired by my collection of vintage Jewel Brite ornaments. Shiny silver material, sequins and cut felt combine to create the kitschmas skirt of my dreams! We all know how I feel about pompoms right? I like them, no I mean I REALLY like them. 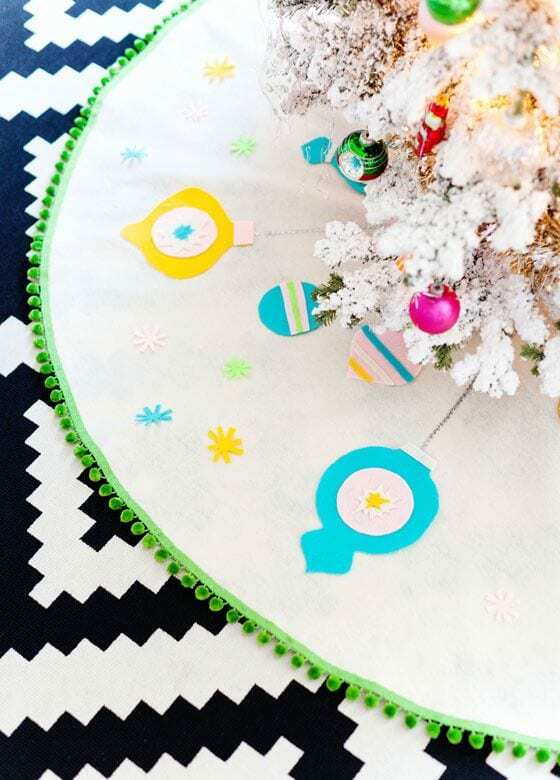 That being said I have strong feelings for this adorable DIY Pom Pom Tree Skirt by Libbie Summers. I may need one of these in my life this year. Luckily I know how to make pompoms in bulk! 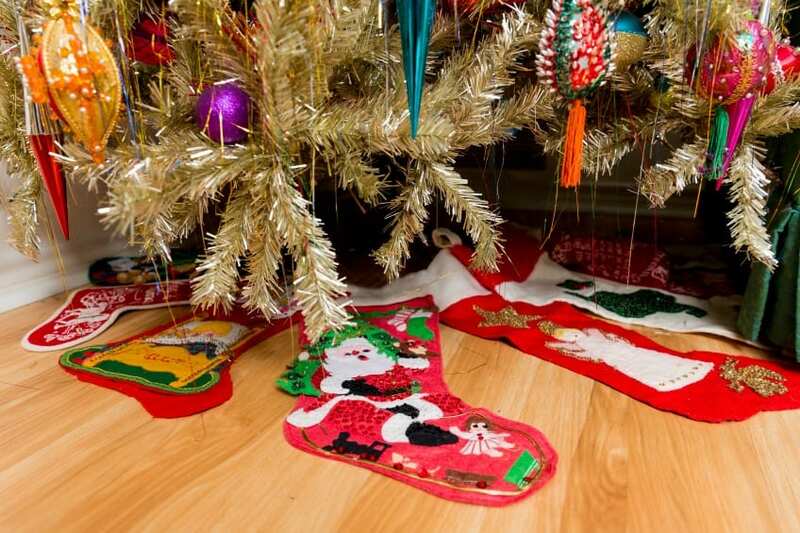 My collection of vintage Christmas stockings was getting out of control. I have way more stockings than I do children so I came up with a plan – make a DIY Christmas tree skirt out of my felt stocking collection. Check out more over on Houzz in An Austin Stylist’s Technicolor Christmas Home. I didn’t actually sew the stockings together I just pinned them so that I could use them in other decorative ways from year to year. This season I have them hung like a window valance. Did someone say no-sew? That is my favorite kind of sewing craft, the kind where you don’t actually sew! 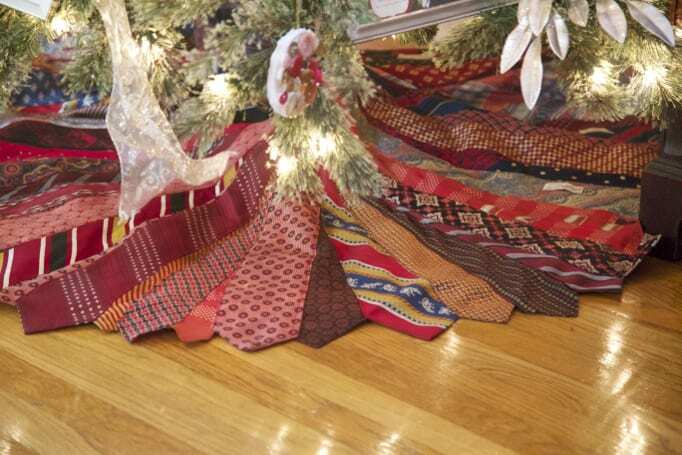 How clever is this No-Sew Ribbon Christmas Tree Skirt – The DIY Dreamer? What a clever way to use up all those scraps of ribbons, trims and fringe. 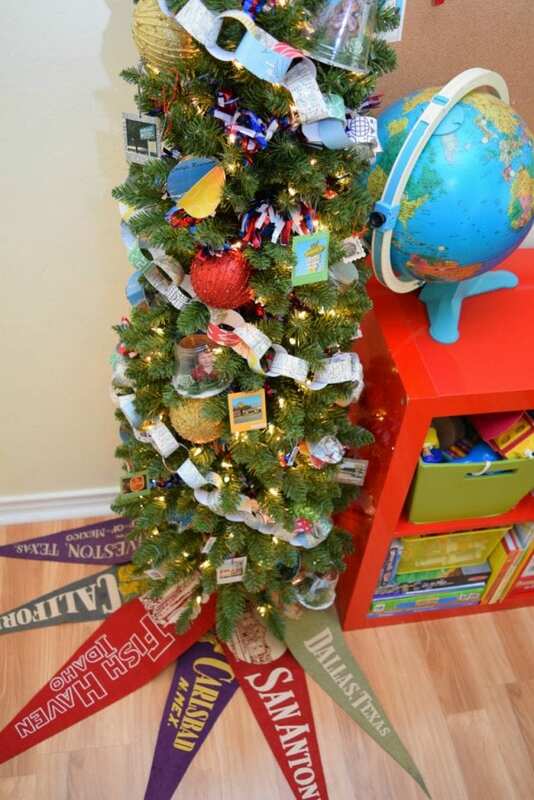 This summer I decorated a Christmas tree with a travel theme complete with DIY Snow Globe Ornaments, Clever Globe and Map Up-cycle Projects and this tree skirt made from a collection of vintage travel souvenir flags. I always love to think of ways to incorporate my various collections into my tree decorations. 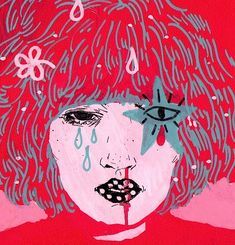 Fun fact – I used to write record reviews, interview bands and co-own a record label. That being said I’ve got a real soft spot for vinyl records. I’ve decorated an entire Christmas tree for National Record Store Day covered in vinyl records. Where was this DIY Vinyl Record Tree Skirt – Rain On A Tin Roof then? It would have been perfect! 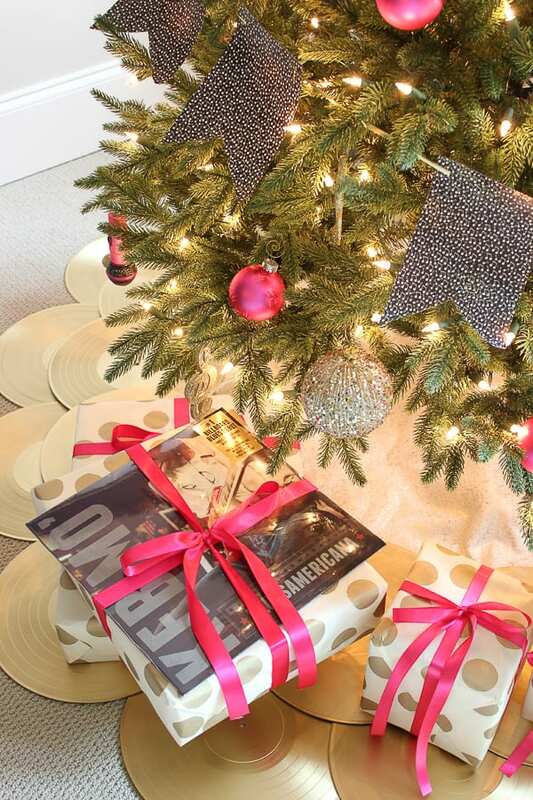 Be sure to check out these 10 Seriously Clever DIY Projects Using Vinyl Records. Not all Christmas sweaters are ugly, some just need to be recycled into something new and improved like say a Christmas tree base wrap. I’ve got a slew of Recycled Sweater Christmas Crafts to share like ornaments, plant koozies and more. When you are done there be sure to check out my Ugly Christmas Sweater Party Ideas on HGTV. You had me at pompom fringe, but then throw in those retro vibes and my Christmas loving heart swoons. This Mid Century Inspired Christmas Tree Skirtfrom Melodrama hits all the right notes for me. Check out all of these amazing pink Christmas trees including another one from Melodrama complete with yet another amazing DIY felt mid-century style skirt. I live in Austin – we take our Mexican food seriously. In fact for most Christmas dinners I make a Feliz Navidad inspired feast of carnitas, tamales, enchiladas and more. Seems only fitting that I would make sure my Feliz Navidad tree had a matching tree skirt. Literally a skirt. 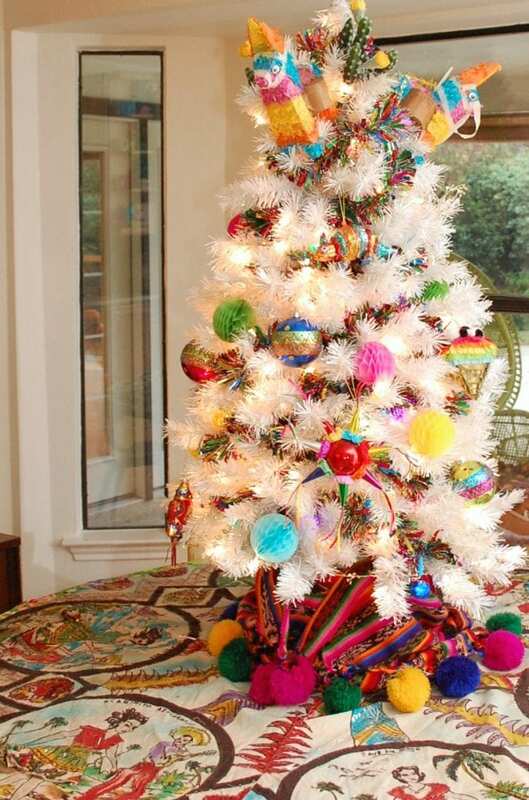 This is a vintage souvenir skirt from Mexico doubling as a tree skirt and table cloth. The only reason I’d ever learn to sew is because there are so many adorable quilting fabric options. I love the colors and patterns in this Giant Dresden Christmas Skirt by Carrie Actually. Over on her site Carrie sells PDF patterns so that you can make your very own with any fabric you want! 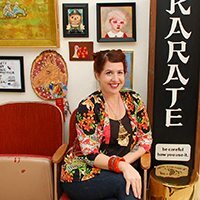 I used to have a skirt you could actually wear made from vintage neck ties. Now I wish I still had it so I could wrap it around a Christmas tree! This Skirt From Men’s Ties by Aunt Peaches is adorable in all those shades of red! 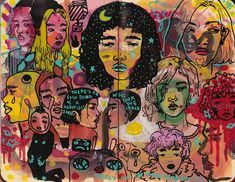 I’ve been hoarding a bunch of 60’s floral ties maybe they have finally found their calling! 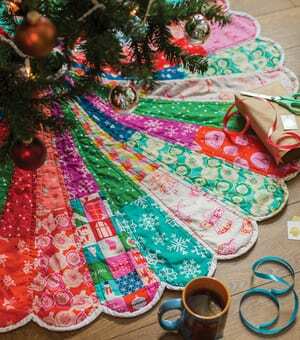 Felt appliques in crazy kitschmas colors inspired by vintage Christmas tree skirts of years past – that’s my kinda tree skirt. I made this DIY vintage inspired felt tree skirt because like most things I make I could not find a skirt to suit my tree needs. Problem solved with a little creative felt cutting, glue and sequins! No more wire tree bases – please. 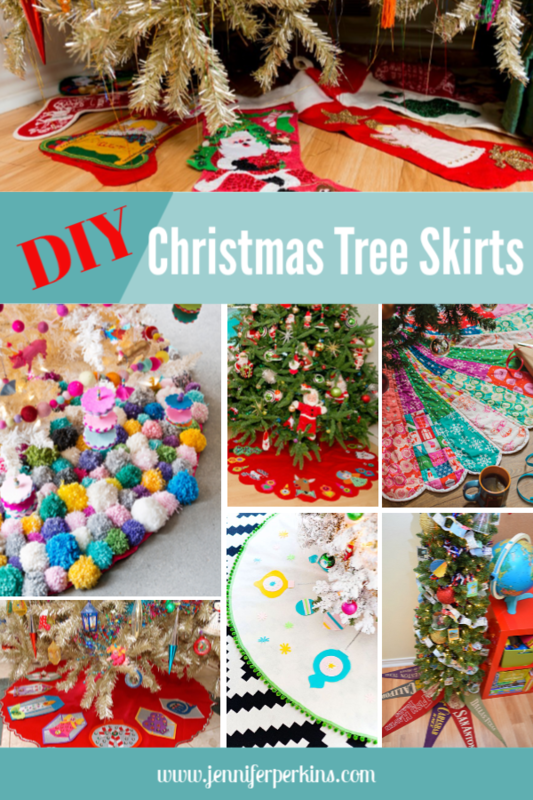 With so many DIY tree skirt options why would you! 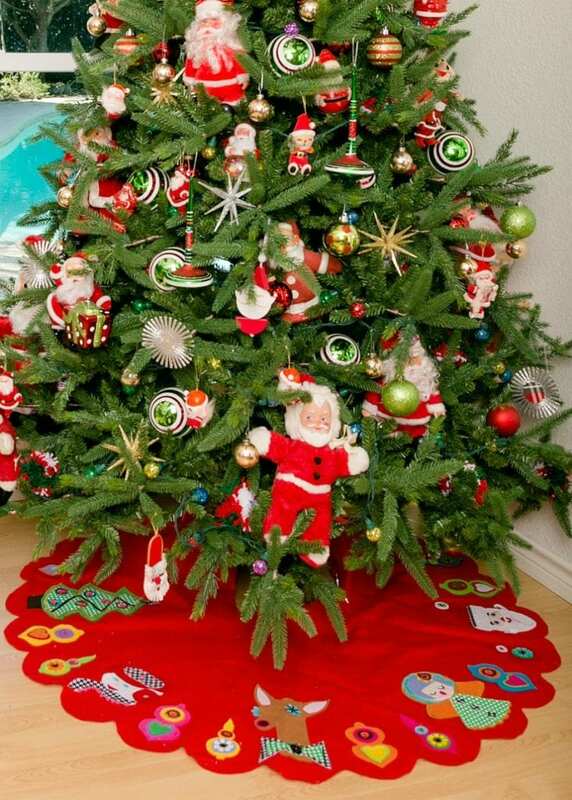 You wouldn’t decorate a tree without a topper, why on Earth would you skip the skirt. 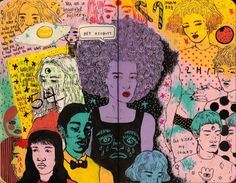 Posted November 23, 2018 & filed under Christmas, Holidays, Uncategorized. 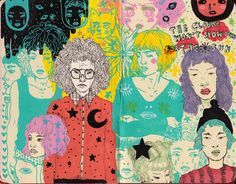 So many excellent ideas! 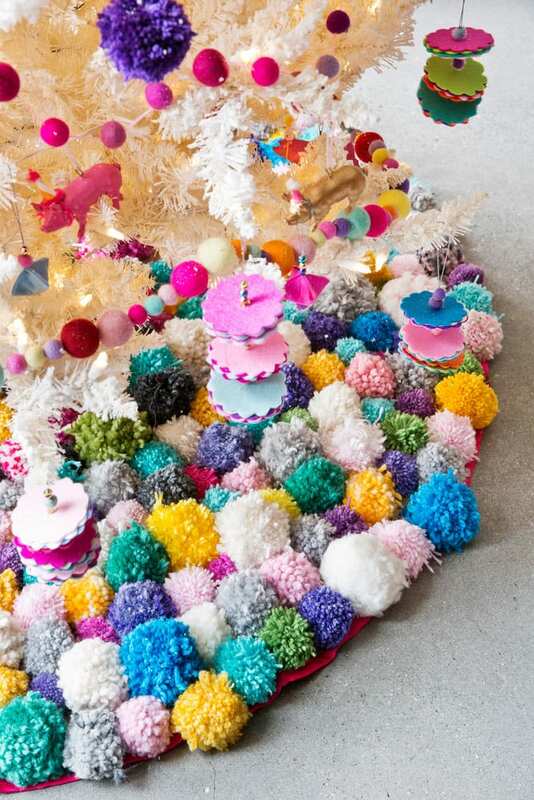 The Pompom tree skirt is so colourful and festive. It may be a bit tough to clean after a while, though, but there are no stains a little baking soda or vinegar solution can’t tackle. LOVE, LOVE the cleaver ideas. Especially if you have several Xmas trees. Some fun ideas for a kids rooms. The records are really “out of the box” thinking. Thank you. lord knows I fall under the “several Christmas trees” category. I agree those records were a favorite for sure!